Unit 67A Cherry Orchard Industrial estate is located in a prime position in this well established southside Industrial Estate. Cherry Orchard is strategically situated to allow access to the N4 and M50 approximately 7km west of Dublin City Centre. Cherry Orchard Industrial Estate enjoys strong demand and is consistently fully occupied benefiting from its close proximity to Liffey Valley Shopping Centre and the commercial environs of Ballyfermot and Palmerstown villages. Adjoining occupants include AVCOM, Pat The Baker, E Cawley Ltd, Softline Panels, Delicatessen Supplies, Lidl, TJ McMahon Builders Providers, Foran Equine, Masonry Fixing Services etc. This High Bay unit enjoys 12 m eaves height. Construction consists of steel portal frame structure with double skin insulated roof Sheeting incorporating c.10% natural lighting, concrete block walls and reinforced dust proofed concrete floors throughout. Front elevation is finished with red brickwork cladding and colour coded PVC metal cladding over to roof level. ACCOMMODATION (SQ. M.) – (SQ. FT.)APPROX. 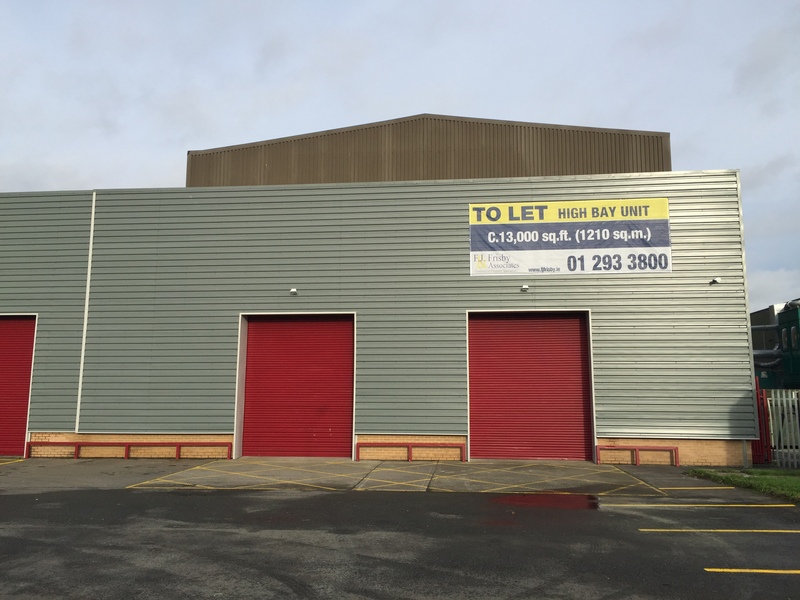 Easily accessible location adjacent to N4 and M50 approximately 7 km west of Dublin City Centre. Excellent loading / unloading and car parking facilities. Opportunity to avail of modern space 13,000 sq. ft.
We understand the main services are provided and connected to the premises including water, electricity (3 phase), gas, drainage, sewerage and telephone.